To make the pea puree, cook the peas according to the instructions on the pack. Place in a blender with the mint, butter and a little salt and pepper. Blend quickly until desired consistency. If the mixture is too thick add a little milk or cream. Set aside and keep warm. Dust the fish fillets with a little seasoned flour, and shake off any excess. Heat the oil in a pan and add fish. Turn once during cooking. Cook in the pan or in the oven until golden brown. 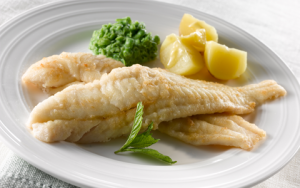 Remove fish from the pan and place on top of the peas. Baby potatoes and fresh vegetables.